For certain young adults, long gone are the days of cautiously driving their parents’ aging cars at 16. Now, the AAA Foundation for Traffic Safety has reported that 88 percent of young millennials (ages 19-24) are engaging in more risky behavior on the roads than ever before. The biggest offenses of bad driving behavior in the last 30 days include texting while driving, running red lights, and speeding. Making matters worse, U.S. traffic deaths have risen by an increase of 7 percent, which is the largest single-year increase in five decades. At Edgar Snyder & Associates, we want to help all drivers on the road stay safe no matter their age. The statistics don’t lie. 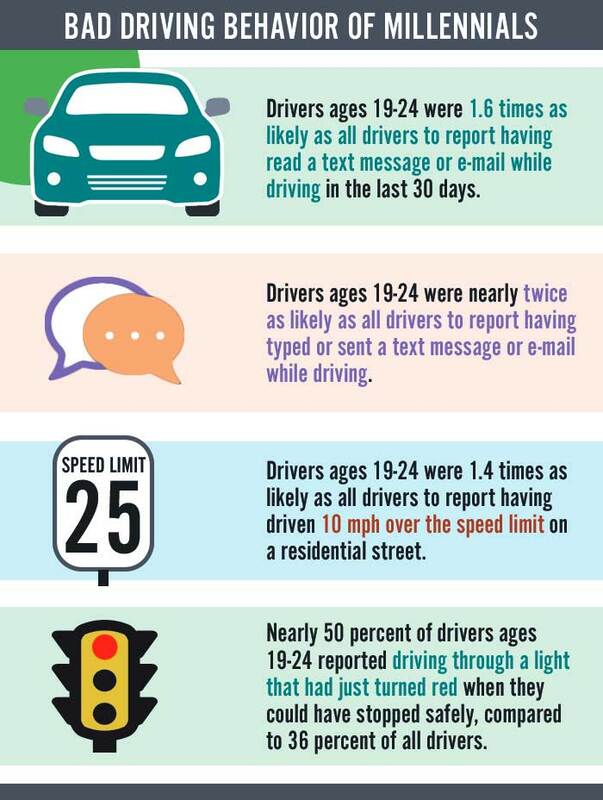 Drivers ages 19-24 were 1.6 times as likely as all drivers to report having read a text message or email while driving within the last 30 days. These drivers were nearly twice as likely to report having sent a text message or email while driving within the last 30 days. Seems simple enough, right? Drivers ages 19-24 were 1.4 times as likely as other drivers to report going 10 mph over the speed limit in residential areas. In a school zone, nearly 12 percent of these drivers reported feeling comfortable driving 10 mph over the speed limit. Police keep an eye on those areas, so speeding there could result in a ticket. Accidents can happen before you know it. Nearly 50 percent of drivers ages 19-24 reported having driven through a light that just turned red, despite having ample room to stop safely. In a rush to beat that yellow light, nearly 14 percent of these drivers feel that it’s fine to zip through a light that’s just turned red. Millennial drivers aren’t invincible, nor are the millions of other people on the road. The reality of car accidents, and their detrimental effects, can change a life in an instant. At Edgar Snyder & Associates, we value helping our community stay safe on the road. Become a member of Snyder’s Drivers to stay up-to-date on driving safety and have the chance to win prizes. You can even take our Safe Driving Pledge for more chances to win. Since 1982, we’ve helped fight for the rights of car accident victims. If you, or someone you love, was seriously hurt in a car accident, call us today for a free case review.